This blog is intended to be a little dash of this, a little sprinkle of that. I'll be giving you updates on my various writing projects, like my novels, as well as some speculations about God, science, and the world view of the twenty-first century. I believe that the reason that God seems so stale to people of our day isn't that he is backwards or obsolete, but that our framework for talking about him is rooted in the twentieth, or even the nineteenth, century. I hope, eventually, to use some fancy-shmantzy scripting, probably in PHP, to automate this. Although there are some open-source things on the net, I want to be compatible with the look and feel of the rest of the site. For now, I'm just going to do it the hard way with plain-vanilla HTML. It's easy to forget the things that God had to invent, outside, of course, of the universe itself. The first thing God had to invent was personhood. As the only personality, there was no one outside of himself. To even conceive that there could be another individual is an immense leap, requiring not only knowledge of self, but an outside perspective of what that self-ness involved, and that there could be another independent self. I believe that the progression of that self-ness included the Spirit and the Son. Time. Think of how timeless our existence would be if there were nothing to measure it by - not even a heartbeat or the progression of days and nights. Today, scientists ponder why the “arrow of time” only runs one direction, which points to it being an artificial construct on the part of God. Evil. This boggles my mind. Nothing could exist unless God created it, so this means that a perfectly holy, good and righteous God developed the concept of evil. The only explanation has to be that God invented what we perceive as evil in order that the greatest good could be accomplished. Still, it boggles my mind. Subatomic particles. So simple, the interactions between them build all the complex structures that define the wonders of the universe - planets, galaxies, stars, life ... human beings. Could God have not created mankind in an already perfected state, although endowed with free will, i.e. free of the very impulse to sin. I have pondered this quite deeply. The first answer is that, not ourselves being God, we cannot understand why this is not possible nor desirable. Perhaps the answer is that he is indeed creating mankind in a perfected state, but that act of creation, rather than being instantaneous, takes all of human history to unfold. Another possible answer is that perfecting humanity may not be God's sole goal for creation. Thinking that we are is a very self-centered and narrow viewpoint. There might, in fact, be other reasons for the process of redemption and perfection that we cannot understand or simply haven't been told. A final answer is that the indwelling of the Spirit, part of the process of perfection for those who have been redeemed, might be one of the goals of the process and, in so doing, God is experiencing humanity from many aspects that would be impossible if he “read the last page” of the book without the rest of the story leading up to it. We treat this indwelling as if it were all about us, but perhaps it is just as much about God. Angels are interesting creatures. Scripture doesn't take us behind the scenes, and what it does tell us is interesting. They are certainly neither omniscient nor omnipotent. In Daniel chapter 10, there is a fascinating portion where an angel is delayed due to a battle with other spiritual forces. An immediate question is where the angel's trip started from. It also implied that there is an invisible war still waging. I drew on that picture in one of my books, &lqduo;Holy War” in which an angel appears with words of encouragement, that he and his fellows are defending their camp against demonic forces. But, in writing science fiction, it does raise the question of how angels travel across large distances. In particular, if there were alien races, whether there would be angels on their planets, also. We usually think of angels as able to fly and, in Luke chapter 2, we do hear about the heavenly hosts departing "into heaven." To me, that implies ascending into the sky. It does not, however, tell us how fast they move, whether it is possible for them to travel interstellar distances at FTL speeds. If not, they might need to "hitch a ride" on starships in order to get to other star systems. That's not so say, however, that God could not have created their own alien angels. If, however, their worlds were un-fallen, there may not be the same need for angels there. Saturday, we made the announcement at services that November 12th will be the last service ever for B'nai Avraham Messianic Congregation, of which I have served as founder and leader for the last 20 years. It was a difficult decision, but one that was not sudden. We are down to an attendance of less than 10 people every Saturday, and that is not enough to sustain the functions required to run a congregation, and also certainly not enough to support the expenses of our current meeting space. In addition, although we have had a fluctuating membership count up to 25 people, we never achieved my initial goal of making significant inroads to reaching the Baltimore Jewish Community in the Name of the Jewish Messiah. The reasons were varied. That community is very close-knit, and even out-of-town mainstream Jews have a hard time penetrating it. The only way to really reach it is for some prominent Rabbi to come to faith in Yeshua, and, despite years of prayer and efforts, that never came to be. I have made my share of mistakes, even invented some brand new ones. I apologize to anyone whom I have offended over the years. It was not done out of malice, I swear to that. My biggest reason for deciding to close down, however, has been the sorry state of the Messianic community. Rather than being a Biblically sound movement “by the Jews and for the Jews,” it has become an eclectic collection of heretics and wannabe Jews, who tarnish the good name of anyone attached to them. Other sound Messianic leaders have walked away from it and, I am sorry to say, I now must join them. I will eventually copy over all the sermon recordings from that web site to this site, but the congregation itself will be shut down. I commented on a discussion on miracles on FaceBook. It was interesting to me that most of the testimonies of miracles involved things like “I was a nasty thug, strung out on drugs...” I don't need to go on, you know the sort. It struck me that, so many miracles involve the human personality, since we already straddle the boundary between the physical and spiritual realms. In that sense, miracles involving personality violate no natural laws, since the very nature of humanity is to already be super-natural. It is like a man, swimming on the surface of the water, being observed by fish underneath. Things happen, from a fish perspective, that have no fishy explanation - objects appear and disappear, the man changes direction for no reason apparent in fish-world, in other words, apparently miraculous. They do, however, have explanations, but they reside in the realm of the air rather than the water. So, too, we exist half in this world, and half out, whether believers in Jesus or not. The half that dwells in the spiritual realm is fair game for God to change in his mercy and grace. Unfortunately, our sight, for now, is in the natural world, so we cannot discern what is going on in the spiritual realm, even though part of us exists there. The bible does, however, promise that someday faith will become sight. Started a new job (still as an engineering manager). Buried my father, and both of my wife's parents. Joined a critique group and shared the first chapters of my fourth novel. They hated it. Really. Sometimes, people hate things for no good reason. They had reasons. Basically, rather than a stand-alone novel, it read like the next 20+ chapters of my first novel. I wasn't too fond of it, myself, so I started over. I'm now about 10,000 words in. I intend to continue blogging, so don't give up yet! Everything we see about the universe, and everything we read in scripture, tell us that God is a lawful God. He not only demands that we follow his law, but he, himself, runs the universe in an orderly fashion. Because of that, there are natural laws that can be inferred, the existence of which is the foundation of all of science. Occasionally, anomalies known as "miracles" have been recorded, which are challenging to reconcile with that orderly universe governed by natural law. One possibility is that they are examples of laws that we have not yet discovered. For someone two hundred years ago, a block of material floating in mid-air would have been considered a miracle. We now have superconducting materials unknown to people of that time that can exhibit free-air levitation. Then there's the whole subject of airplanes, which use aerodynamic principles to do something once deemed impossible. I could go on and on. Since we actually know little about the functioning of the universe, unknown laws are a distinct possibility. For example, scripture hints at a whole angelic realm, invisible to us, filled with battles and creatures of which we are unaware. Those angelic beings interact with us and can produce miracles that are not violation of natural law, but "lawful" interactions with invisible beings. Other miraculous events are not unlawful, merely improbable. There is, for example, a phenomenon known as Brownian Motion where the random motion of atoms cause larger objects to move in random directions. It is improbable for all those random motions to line up in one direction, but still not a violation of natural law. Lest you think this insignificant, the effect is strong enough to allow Jesus to walk on water or even rise into the air. Another example is miraculous healings. By manipulating the probability of unlikely events, disease organisms could spontaneously die, or cells regenerate. Note that this discussion is not meant to determine the dreaded "natural explanations" for miracles, but simply to demonstrate that, although supernatural in nature, they do not necessarily violate physical law itself. God can remain an orderly God, yet intervene directly in our world and, more importantly, in each of our lives. June 3, 2014 Holy War is now available! It took a whole lot longer to finalize than expected, but it's now available in paperback and Kindle. Buy it, enjoy it, review it (please!). I've finished the editing and proofreading of my third novel, Holy War, so I've posted the "final" first and second chapters to this web site. Go have a read! You still have time to pick up a copy of the first book in the series, Seeking Adam. The novel has won Honorable Mention in the Christan Science Fiction/Fantasy contest in the Reader's Favorite Book Awards for 2013. Woo hoo! May 27, 2013 First cut of Holy War is done! It makes me tired just to talk about it, but I'm getting more used to it, since it's the third time I'm going through it. The only wrinkle is that, once I assembled the first cut together, it turned out to be shorter than I had wanted, so I already know that I'll have several chapters work of supplementary material to add. In athletic contests, there's usually an "out of bounds" marker, beyond which the referee can call a penalty, which in US football is usually signalled by a yellow flag that's thrown down on the field. As far as what passes for "science" today, I'm reaching for my yellow hanky. The basis of the scientific method is to formulate a hypothesis, make a prediction, devise an experiment to test if the prediction, is fulfilled, then, if so, have other researchers repeat the experiment until there is agreement that the hypothesis is confirmed and therefore it advances to become a theory, which is then generally regarded as being true. There is, however, never any absolute certainty in science, since new theories can modify or even supplant earlier ones. For example, Newtonian physics said that the force of gravity decreases by the square of the distance between two objects, but Relativity has shown that the exponent is very slightly greater than 2, but by such a small amount that in every case not involving interplanetary distances it is usually disregarded. Almost all scientific theories have advanced this way, but there are notable exceptions. One of them is the theory of evolution. The problem with this theory is determining an experiment that would disprove it. In fact, most of the experiments dealing with any proposed mechanism underlying evolution have resulted in disproving and not confirming the hypothesis. For example, Darwin in his original theory proposed that the underlying mechanism driving gradual change was the experience and even intent of creatures being passed down to the offspring. A girafe stretches its neck in order to reach leaves higher on the tree, and so its descendants have longer necks. This hypothesis was disproved with the science of genetics, which has shown that acquired characteristics do not pass onto offspring. After this, micro-mutations were proposed, but there are serious issues with this, since a series of mutations each have to be beneficial in order to be favored, but, for instance, a creature that cannot run very well nor fly at all is an unlikely advantageous steppingstone between a lizard and a bird. Even today, there is no hard experimental evidence for any underlying mechanism. Flag down on the play. When science plays by the rules, it is a fitting companion to the contents of the bible. When it instead charges off the field and up into the stands, assaulting anyone it wishes, it's time for it to be restrained. A lot of people, both from the Christian and the humanistic world view, wish that near death experiences would just go away. But on this blog, I'm brave/crazy/stupid enough to take a look at them. There is an organization that seems to be taking a relatively straightforward look at the phenomena, with less of an axe to grind than most, namely, the Near Death Experiences Research Foundation (NDERF). I've read the book, Evidence of the Afterlife: The Science of Near-Death Experiences, written by the founder of NDERF, Jeffrey Long, with another gentleman, Paul Perry. I find it very interesting. He presents nine lines of evidence that the near death experience isn't some sort of hallucination or fabrication. At first glance, it seems like Christians ought to be jumping for joy that there's empirical evidence for an afterlife. There are problems, however. The identity of the Being of Light is too vague to match the God of the bible (we'll call him after the Jewish manner, "haShem"). During the experience, people across the world, worshipping many different gods, simply identify the BOL with their own particular god, and the BOL doesn't chide them for their error. This doesn't square up with haShem, who has resisted strongly being identified with any other god. Although a small proportion of the participants report "hellish" experiences, that proportion is too small to match up with the biblical framework, given Jesus' description of the "narrow road" that leads to salvation and the "broad way" that leads to destruction. The personal evaluation they experience is based on how the participant made others "feel," not on any sort of concrete standard or whether the participant followed God at all. Across all the world's religions, surely, someone must be right, and, given the huge disagreement between them, everyone else must be wrong as far as the character and name of the divine being. Why didn't the BOL give answers? When prophecy is recorded in scripture, the recipients recalled them in precise detail, yet, when NDE participants return, all the "juicy parts" have become fuzzy and vague. It could still all be a hoax, or some yet undiscovered mental process. All of the NDE participants might belong to what the bible refers to as "the elect," those, as the bible describes, predestined for redemption since before creation, even if they were not, at the time of the NDE, explicit believers. In that case, all the participants met the God of the Bible, although they may not have realized it yet. It's like you met the president in a hamburger shop, and just thought he was an important person from all the bodyguards, then afterwards were told who he was. All of the NDE participants might belong to the population known as the "lost," destined for hell, and therefore the BOL was, in fact, the devil of scriptures, masqueraging as an angel of light, as we had been warned he might. Although I'm reluctant, from the scientific side of things, to point fingers at a grand deception, we know so little about the spiritual realm, that we can't evaluate scientifically what goes on "beyond the veil." In summary, all of these accounts are interesting, but I would caution against letting any of them disturb your faith. If you do examine any of them, make sure to read the original accounts and not the summaries, since those tend to put a "spin" on the accounts. I'm posting this ahead of time so you'll have advance notice. It's at Constellation Books in Reisterstown, Maryland, from 3:00 PM to 5:00 PM. Stop on by and say "Hello!" Let's speculate about a creature that shows up in the Christian Bible, all the way forward from the third chapter of Genesis, namely, the devil, Satan, the great source of evil. Not much is known about his origin, other than that it was angelic (but not the sweet, fluffy golden-halo version of popular culture). We do, however have an interesting hint, that meshes well with what science tells us. Satan is identified from the very start with reptiles, but more complex and intelligent reptiles than those that exist today. Sort of like what scientists tell us the age of dinosaurs was like (well, OK, one of them spoke to Eve, which is a little out of mainstream science, but not out of the realm of SF, which has speculated, for instance, about the intelligence of velociraptors). Fasten your seatbelts for the wild-eyed speculation. Suppose Satan was originally the angelic being responsible for the reptilian realm. We have hints, in scripture that the major kinds of God's creatures (animal, men and birds) are represented in the creatures around God's throne, but not the reptiles. Maybe Satan was the head angel for that realm, but got booted out. So, to recap, we had a world teeming with powerful reptiles of all shapes and sizes, but God, instead of choosing reptilian life for the height of his creation, chose mammals. I can imagine Satan was quite ticked off at that point, and that could have been what pushed him over into outright rebellion. Having been around the throne of God, Satan must know that he can't win in open combat, so what's his game? Maybe he figures, if he ruins this mammal experiment, he can make the case once again for reptiles. I took this approach in the novel I'm working on, Holy War..
Wheher these wild speculations are true, we do know that Satan and his army yearns for your ruination and for obstructing the plan of God. Consider yourself warned, and know that only the power of God will protect you from these creatures. Seeking Adam is a finalist in the Readers Favorite book contest, under the "Christian - Fantasy / Sci-Fi" category. Take a look here! May 30, 2012: My novel, Seeking Adam is now out! You can also read a review of it here. January 12, 2012: Editing completed on Seeking Adam! The editing work is completed, and the book is on schedule for release in early 2012. Now, what's left is formatting and cover design. The print and Kindle editions are planned to be released close to each other. You can read an interview with me on this blog. Head on over and have a look! If evolution were true, it is unlikely we would find any kindred societies among the stars. The only hope to find societies near our own level is that there is a creator. Evolution says that the world has existed for about 4,540,000,000 years. A technological society has only existed on this world for about 100 years, or .0000022 percent of the time. If a world similar to ours had simply developed 1% faster, that would mean the technological civilization would be 45,400,000 (that's 45 million) years older than ours. I doubt we'd have very much to say to each other. Evolutionary science says that dinosaurs ruled the earth for 160 milliion years, until a great extinction event occurred. Scientists still debate the nature of that event, but current consensus is that it was probably a meteor strike. After that, it is said that other creatures then developed 65 million years ago, leading to us. So, the whole existence of a technological culture at all is dependent on that random event occurring. Had it occurred a million years earlier, civilization would be a million years older. Had it never occurred, there would be no technological civilization on this world, just dinosaurs. Either way, it doesn't result in any kindred races! If, however, the universe had an intelligent creator, he could have created life on other worlds in similar timeframes to ours. See my earlier post on aliens as far as where to go with that. I was in the author's tent, schmoozing, signing and selling my book. I met a lot of good people, and sold a bunch of books. The Christian doctrine of the Trinity says that God exists as a meta-personality, three persons in one, yet, really only one Being. Isn't it time we moved beyond 19th century analogies? I mean, water, ice, steam only gets you too far, and it's really not accurate, tending towards modalism. My favorite, online multiplayer games. You have the user playing it (perhaps akin to the Father), the in-game avatar (akin to the Son), and the game client itself (akin to the Spirit). Which one are you? In a sense, all of them, although they are all separate and independent. Similar, but different - you are running a computer application in "the cloud." You have a client in your machine, an app running on the network, and the network itself. Which one is the app? Once again, three different things, one unified whole. Your brain. In treating severe epilepsy, doctors can do a procedure called "slpit brain" in which a structure called the corpus callosum is cut, separating the brain into two hemispheres. Experiments have been conducted on patients who have undergone that procedure, and scientists have discovered that they have the equivalent of two separate individuals living in one body, with different sets of abilities and weaknesses, unified by one overriding personality so that they function as normal adults. Three different components, one individual. OK, it's only two natures, not three (at least, not as we've discovered yet), but the long standing particle and wave issue. Is an electron a particle or a wave? Sometimes, it seems like it's one, then, the other. It's nature is complex enough that the only way to understand it is by thinking of it as two different things, even though, it's really just an electron. I'm sure there are others out there, but I hope these have gotten your mental juices flowing. When I grew up in the 1960's, all of my crowd imagined that by now, early in the twenty-first century, we'd have passenger flights to the moon, and manned expeditions to Mars. The movie 2001, A Space Odyssey, summed up our conception of the era in which we live. I shouldn't have to point out that it never happened. Instead, we've spent forty years stuck in low Earth orbit, with only occasional robotic flights to Mars. The moon has been virtually abandoned. We landed on it a handful of times, then pulled back, not to return for decades. The latest estimate for manned government flights back to the moon puts them past the end of my life, if I live to an average span. Incompetance. We're just too stupid, aggressive or short-sighted to be successful at the long-term planning and prioritization required of a space-faring people. Scientifically, we could have done all that is pictured in the 60's movies, but for one reason or another, we miffed it. Leadership, both in NASA and, especially, congress, micromanaged the technical part of the program into oblivion, and so, here we are. A distinct possibility, however, is that there could be deeper issues here. Sin or an even deeper evil conspiracy. Incompetance, a failure of ability, blends into sin, a failure of character or will. In that sense, we have to look at the reasons that leadership failed, and at least some of it stems from selfishness and a desire for personal gain and approval over and above service to others. There might, however, be a deeper conspiracy by the ministers of the devil himself, keeping us here on this world, preventing us from expanding out into the universe. I go this route with the novel I'm working on, Seeking Adam, which should be out in 2012. God's plan. I can see that letting sinful, fallen man off this world to corrupt the rest of the universe could be a very bad thing. In addition, if God is planning on bringing judgement on this world, he would want the entire human race in one spot so that judgement would fall upon all of us at the same time. This wouldn't mean we'd never get to other worlds, just that we wouldn't get there until after Jesus returns, at least not in a permanent fashion. Considering that everything is subject to the will of God, as believers, we need to seriously consider this. In any case, we are all together on this world for the forseeable future, and it has been commanded us by God to live on it in accordance with his will and in fellowship with him. An audio interview with with me has now been posted on a podcast! Go check it out and enjoy. July 4, 2011: Where do Aliens Fit in God's Plan? The bible talks about our world being "fallen." By that, we mean that Adam, created in fellowship with God, dwelling in sinless perfection, decided, of his own free will, to turn away from him and disobey. Because of that, Adam, and our entire world fell out of fellowship with God, bringing consequences that rippled through all aspects of it. In a sense, we therefore live in a world that has broken down in many ways. The question with respect to alien races is based on the extent of that "fall," whether it spread out through the rest of the universe, or whether it was limited only to some neighborhood of our planet. In C.S. Lewis's Space Trilogy, (Out of the Silent Planet, Perelandra, and That Hideous Strength), he conceives of the rest of the universe as unfallen - free from the taint of sin, cut off from our world by the fall of Adam. If, on the other hand, the rest of the universe is fallen, it is therefore separated from God and in need of redemption, so we must ponder how it is to be redeemed. In Lewis's Chronicles of Narnia, (plus unrelated references in Perelandea)he conceives of a different incarnation of the one and only Savior for every world in need of redemption. There is another solution. In the book I am working on, Seeking Adam, I conceive of a universe that is "stuck in the Old Testament," seeking redemption, which is only available on this world through the one unique act of redemption by the Son of God. I didn't choose that because I believed the bible teaches it (it's notably silent about the whole subject of other worlds), but because I thought it made the plot more interesting, which is my perogative as the author. Of course, you most likely live in this world, so for you, it's not a problem. You need a redeemer, and his name is known in English as Jesus, and the original Hebrew as Yeshua. Sound intriguing? Science Fiction is replete with notions of joining with something higher than ourselves. There are the Trill in Star Trek™, the Force in Star Wars™, or even the Goa´uld in StarGate™ (well, OK, that wasn't always pleasant, except for the Tok´ra). In each case, the union produced was more powerful, or imparted more wisdom and knowledge, than we mere mortal humans could ever manage on our own. The intriguing offer I used to open this posting is nothing more than a 21st century rendition of what is known in Christian and Messianic circles as the “indwelling of the Holy Spirit.” Before you hang up on me (OK, click out of this page), hear me out. Jesus/Yeshua makes a radical promise, that he will send the Holy Spirit to indwell those who trust in him. This was to be a new and special relationship, bringing to the recipient purified character, and the power (in certain circumstances) to do things that are impossible for humans generally to accomplish. Now, from practical experience, let me say that the result of this union is a new creation, retaining the better parts of the personality of the human, combined with the moral perfection (and, “personality,” if you will) of the Spirit. To call this merely “symbiosis” is like calling life “controlled oxidation.” It is instead the making of a new, combined being, like so many examples in science fiction, except that this isn't fiction, but real. People dismiss it too quickly because they frame it in descriptions written for people without our depth of knowledge, but when instead written in modern terms, it doesn't sound all that backward or ignorant now, does it? My novel, Dauntless Homecoming, is the winner in the Science Fiction category of the 2011 New York Book Festival. Let's imagine you're a pregnant woman. Someone walks up to you and says, "I hope you're looking forward to the birth of your child! The morning sickness, the sore ankles, then the birth itself, the screaming agony where you'll writhe in pain and curse every man alive! It will go on for hours and hours, until you wish you were dead! It's such a wonderful thing, isn't it?" Ridiculous, right? The joy in having a child isn't the pregnancy or the labor, but the wonder of holding a baby, of watching him or her grow up, develop, become the person God meant for him or her to be. That's what makes the pain of pregnancy and childbirth worthwhile. We as believers in Jesus/Yeshua are too much like that discouraging someone. We are fixated on the Great Tribulation, the terror and trouble coming upon the world. We turn to a terrified and hurting world, and our word of "comfort" is all too often, "You think this is bad? Just wait until Jesus comes back!" Then we wonder why people cross the street to get away from us. One of the reasons I wrote my novel, Dauntless Homecoming, was to imagine what the world would be like "on the other side" of that time of trouble, which Jesus himself even calls "birth pangs" in Matthew chapter 24, verse 8. It pictures a world that has had the stuffing kicked out of it, yet has become a wonderful place. People still go about their daily lives, have their own hopes and ambitions, but, underlying it, is love incarnate, who seeks that all would grow and know him. It's not an amusement park, a "Pleasantville" where nothing goes wrong, but a place where adventure can still be found, and challenges still must be faced. I've reduced the price of my novel, Dauntless Homecoming, in both the the Kindle version, and the Nook version, to US$2.99 to be in line with what other indie novels are charging. Because of various internals of the way both those vendors determine royalties, it's very unlikely I'll reduce it any further anytime soon. Well, the results are in, and the novel has won honorable mention in the science fiction / fantasy category of the Five Star Dragonfly Book Awards. You can applaud if you'd like, but it would make me happier if you bought the book! My poem, Ghost Ship, is now appearing in Digital Dragon magazine. Click on over an have a read! Oh - and I've reduced the price of the paperback edition on my eStore from and Amazon.com, from $18.95 to $14.95. Can I hear a polite cheer? December 30, 2010: What is a soul, anyway? We believe that there is a something, called a "soul," that transcends the physical "us," that exists even when our body dies. That soul then is subject to judgement after the death of the body, and then enters into eternal punishment or award. So, what is it? There isn't enough information in scripture to say for sure, but there's no law against speculating. Information itself. This would be some internal state of our minds (every neuron, every chemical level, etc.) that then could be "backed up" and transferred to a different "processing unit." Think of a piece of computer software that can be moved from machine to machine. This is the easiest possibility in the sense that it keeps the action in our universe, but it raises tons of issues. What happens to someone who becomes severely brain-damaged? When is the backup of our brains done? When we sleep? This could mean we might lose the memories of the last day of our lives. Things we forget would be forgotten forever. Some form of matter we haven't discovered yet. For example, "dark matter." It's tempting to imagine an entire dark-matter universe with dark-matter beings and dark-matter planets all around us but, since it wouldn't interact directly with us, we wouldn't perceive it. Maybe we exist as a connection between dark matter souls and everyday matter. Another dimension. This would mean that the soul exists outside our three dimensions, not directly able to be perceived by our 3D senses. In my novel,, I imply that demons, at least, exist in another dimension. Out of the universe entirely. See my post for November 30. It also strikes me that, in answering the question of what the soul is, we also must address what Heaven is. It's fun to speculate, but a more important question is whether your soul, whatever it is, will wind up there after your body dies. That's a real question, and it's up to you. I'll be the guest at Constellation Books in Reisterstown, Maryland, from 3 PM to 5 PM. I plan to read and discuss my novel, Dauntless Homecoming as well as make signed copies available for purchase. November 30, 2010: Is the universe more like a bag of marbles, or an MMORPG? To those who don't know, “MMORPG” stands for “Massively Multiplayer Online Role Playing Game.” Famous examples are “World of Warcraft,” “Lord of the Rings Online,” (my favorite) and “Guild Wars.” They're played by people all over the earth, who log into servers and interact with each other in a virtual world. When they look at their screens, they see virtual grass, virtual trees, virtual characters controlled by other players, and things called “Non-player characters,” or “NPCs,” which are characters controlled by the computer itself. Sometimes, NPCs are so sophisticated that they can be mistaken for other players. It looks real, but it's not. Each element of that world obeys certain rules, but it's the computer that calculates the position and condition of every single object in that world and displays it to the players. The rules (technically, the algorithms) alone constitute the world. Unfortunately, some particles remain strangely elusive, such as the particle that is supposed to mediate gravity. There are other problems with the “bag of marbles” model. For example, very small particles called “quarks” exhibit the strange property that, once you entangle them, they seem to “know” each other's state, even if separated by a wide distance. Perhaps there are no marbles at all because the universe is closer to a MMORPG. We know, based on God's revelations to us, that he is omnipresent (everywhere at once), omnipotent (can do anything that is logically possible), and omniscient (knows everything). We also know that he's not part of this universe, but stands outside it as its Maker and Judge. Since this universe is all that we know, we have a hard time imagining what it would be like outside of it. Scientist then step “out of bounds” and tell us that there must, therefore, be nothing outside of it. In our world, an MMORPG runs on a collection of high-speed computers called “servers.” The only “server” that could be complex enough to simulate the entire universe, particle by particle, force by force, would be the mind of God Himself. Bear in mind, this isn't the philosophical theory of “idealism,” which says that it's the thoughts of the inhabitants of the universe that forms it. Our thoughts are immaterial – it's God's thoughts alone that constitute the universe. We can no more alter the state of the universe by our thoughts than a character in an MMORPG can change it's characteristics by wishing very hard. For example, your hunter character can't wield that two-handed broadsword no matter how hard you'd wish it could when that giant ogre is chasing you. It also isn't pantheism. Pantheism says that the universe constitutes God. Instead, I'm speculating that the universe is composed of the thoughts of God. If God decided to think something else, the universe would end but He would continue. If this is the character of the universe, miracles are certainly possible. They either represent a temporary change in the rules, or reflect rules that we haven't discovered yet. Only God can do this, since we are completely bound by the rules he's established. The only other question that needs to be answered is the identity of the players. I would speculate that there is only one player, namely God Himself. In this sense, it's backwards from an MMORPG, where many players make up characters and play in the pretend universe. 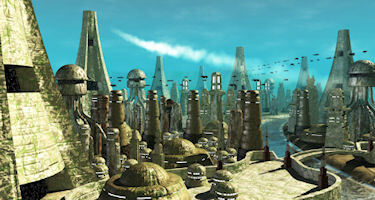 In the real universe, many who appear to be “players” could be really only NPCs – although sentient, their existence is restricted to the universe and no farther. We only get to transcend the universe when indwelt and yielding control to the Spirit of God, the only real “player.” When that happens, we gain a glimpse of “something” that lies beyond, and a “Someone” who transcends anything we have ever imagined. That “Someone” entered the universe in the person of Jesus the Messiah, to die for us and free us from the “rule” of sin and death. Recently I completed an online author interview with Daniel Carter, author of The Unwanted Trilogy. Check it out! October 30, 2010: Revision to Dauntless Homecoming completed! As noted in the October 10 post, I had begun the process of updating the paperback edition. It's now complete, and the copy you'll get on Amazon.com is the "better" one. Still no promise that it's typo-free, however! October 13, 2010: Short story published! A short story of mine, Transit of Gem, has just been published in the magazine "The Cross and the Cosmos." You're welcome to head over there and read it. I have discovered that I'm a lot better writer than I am a copy editor. As was pointed out to me by the only reader who has bothered to review the book (sigh), the July edition of the book had quite a few typos in it. I have spent the last few weeks combing through the book, page by page, and have, I believe, a much cleaner edition. I uploaded it to Kindle a week or so ago, and should have a new paperback edition out in about a month. Bear in mind, most readers who have spoken to me have enjoyed the book, even with the typos, so you don't have to wait, unless that kind of thing annoys you.